October is international breast cancer awareness month. In support of the campaign Platform 22 will be hosting a special event featuring work by Torphins artist Ingeborg Bodzioch. 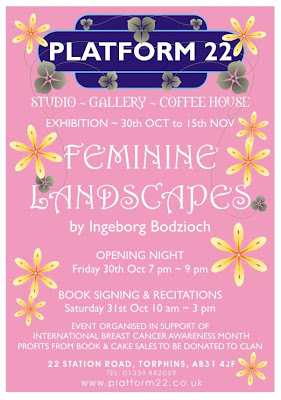 On the evening of Friday the 30th of October, from 7 pm, you are invited to attend a preview of Ingeborg's artwork and listen whilst she reads extracts from her book "The Soliloquy of a Female Crisis". The book has been written and illustrated by Ingeborg along with Cecelia Ottenweller and Tony Bodzioch, and was published with the breast cancer awareness cause specifically in mind. On Saturday the 31st Ingeborg will be at Platform 22 from 11am until 3pm to sign copies of her book and to talk about her work and experiences. The exhibition will then run for a further two weeks ending on the 14th of November. All profits from sales of the book will be donated to CLAN (Cancer Link Aberdeen and North) as will profits from the sale of cakes and homebaking in the Platform 22 coffee house. I hope you will be able to join us for what promises to be an inspiring and uplifting event. It would be lovely to see you at the exhibition launch on Sunday 2.30 to 4.30pm at the Bield at Blackruthven. This collaborative exhibition includes an exciting and wonderful mix of ceramics, basket work and combinations of the two crafts. 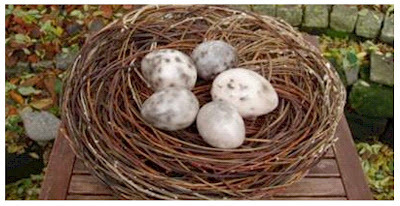 There will be a raku workshop on the 17th and 18th and a photography workshop to help members photograph their work on the last day of the exhibition. The grounds of the Bield are lovely and it is near to Gloagburn Farm Shop for yummy, healthy food and nice teas too!